My view is that Hanabi is a chore to play and you shouldn’t punish yourself with it. My view though is sufficiently minority that it’s experiencing a rollback of civil rights under the Trump administration. We gave it one and a half stars in our review and I’m pretty sure that is some kind of board-game felony punishable by ten years in a Monopoly board prison. If you’re more swayed by the common consensus than our contrarian viewpoint you’ve come to the right place. Let’s see if it’s more impressive in its accessibility than it is in its gameplay. Stand well back. Please do not return to the teardown once the touch-paper has been lit. The first few rows are going to end up on fire. See, while these symbols are unique they’re not actually very memorable. White gets a spherical burst. Red gets… a spherical burst. Blue gets… oh look, a spherical burst. It’s certainly going to be possible to commit the exact patterns to memory but certainly the first half dozen games or so are going to suffer. Each card is uniquely identifiable even taking into account colour blindness, but the game still manages to exhibit problems. These would have been easily resolved if each colour of firework had a name to go with it or some kind of unique and distinctive symbol. To be fair there are also Kanji symbols on each number that are uniquely identifying but I’m not sure how useful they’d be as an identifying description to most players. ‘This one is like a waffle with a handle at the top’, or ‘this one looks like a stick-figure ninja throwing serious shade at the camera’. Vogue! There’s really nothing to it. But that leads us into the deeper problem. What does it mean to give a colour clue when one or more players may be colour blind? Here we have a deeply problematic linguistic incompatibility – ‘this one is blue’ is not a clue that will necessarily mean the same thing to different people. Someone who is colour blind may associate the clue ‘blue’ with the colour ‘green’. Someone may associate ‘red’ with ‘green’. 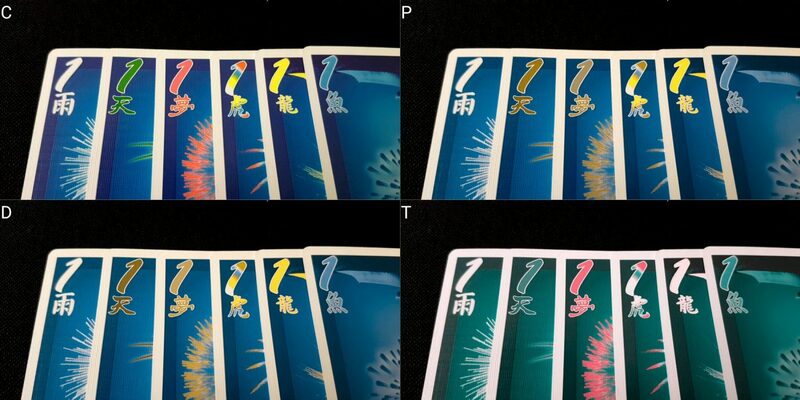 Someone who is monochromatic may find it difficult to express symbolic kanji or firework symbolism in a meaningful way, at least until there are cards of each type already represented in the display. Sometimes the clue will end up being ‘this card and this card are the same type as this card’. We don’t recommend Hanabi in this category although it’s an interesting case study in how technical adherence to good accessibility guidelines does not necessarily guarantee accessibility. 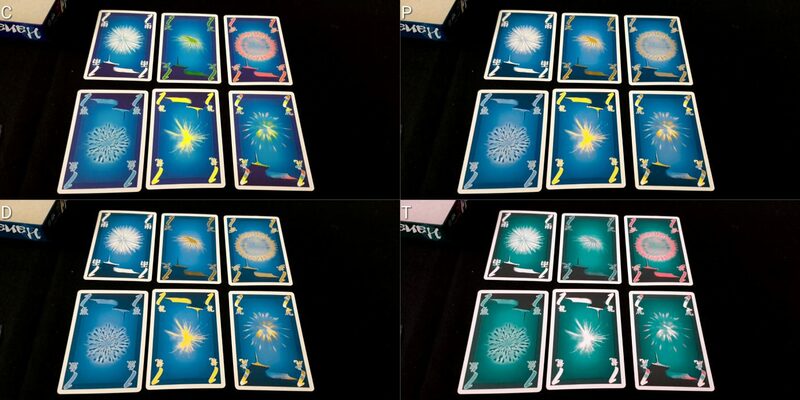 Here’s one of the interesting and unique things about Hanabi – the typical tools for visually impaired players to investigate a hand of cards will be all but useless. You’re not trying to inspect your own hand for meaning, you’re trying to inspect that of the other players. Of a necessity they’ll be holding them at a distance that is comfortable for the group, rather than the individual. If you want to get a good look at someone else’s hand you’ll need to get up close whilst simultaneously making sure you don’t reveal your own hand to yourself or their hand to them. They might be able to pass a hand to you for inspection but it’ll need to be done with all the methodical care of a bomb disposal expert. Revealing even a single card to a player can dramatically upset the game balance. The more players, the more difficult this visual parsing exercise becomes. The cards aren’t visually distinct enough to yield themselves especially well to distance viewing when a visual impairment must be taken into account. There are also rainbow cards for advanced players that make it even more difficult to work out at which cards you may be looking. Relatively poor contrast between some numbers and the background too doesn’t help. The numbers are at least quite large and this mitigates the contrast ratio problems somewhat. The individual tokens you get to discard are tactile indicators as to the number of clues available. The fuse tokens are visually inaccessible in terms of their iconography but all that’s needed is a count to know how close you are to failing the game. For some types of visual impairment the explosion pattern of individual fireworks is likely to blur into indistinct shapes that don’t serve a useful role in differentiating colours in the absence of other information. You’re assessing all of this against a shared game state on the table, trying to make sure that the clues you give are sufficiently useful as to avoid mistakes in play. And of course, for players that are totally blind there is nothing at all that would permit any kind of meaningful play. We don’t recommend Hanabi in this category. In terms of fluid intelligence the game doesn’t ask much of its players – play a card, give a clue, discard a card. It does require some numeracy, but only in terms of recognising numbers and their orders. If someone can count from one to five and recognise the Arabic symbols of each they’ll be fine. We’ll give a very strong recommendation here. What colour and number do other people think their cards are based on inferred information? That’s where almost all of the gameplay is to be located. Even if you adopt a rigorous approach to hand management based on clues it’s still going to be necessary for you to remember what your strategy means. If you group based on number for example you’ll still need to remember what number is represented by an in-hand grouping. And if you forget you played a card the entire system you have will fall down. Hanabi is a game that has almost zero wiggle-room when it comes to the memory burden the game places upon you. If you forget one clue about your cards it can undermine everything else you think you know. Similarly, if you forget that someone was already given a clue you might waste one of your limited tokens repeating it. Coupled to this is the additional complication – the extent to which you remember your cards is an unknown quantity to other players. It’s perfectly legal for players to give reminders as part of their clues, but other than house-ruling your own more forgiving variant of play they’ll just have to work on the assumption you remember, or not, based on how you play. In terms of a cognitively accessible variant, I don’t think you could come up with one that still meaningfully retained the experience of the game. We’re giving Hanabi a straight up F in the memory impairment category. I honestly don’t see how it could be at all playable for anyone with a poor or unreliable memory. 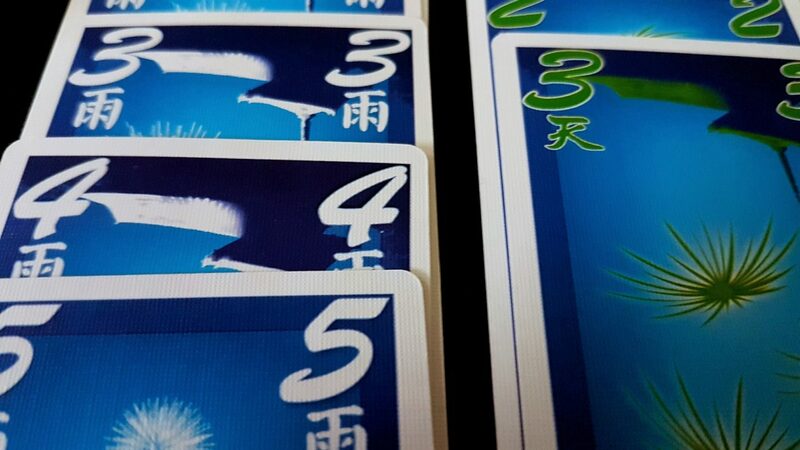 There is a significant cost to each mistake in Hanabi. If you place an incorrect card you lose one of your three strikes, but also the card itself is discarded. That might make a firework display impossible to complete, or mandate a lot of juggling tokens until it comes up again from the draw pile. If you play a bad card, it’s usually difficult to declaim responsibility. After all, you were (presumably) told the colour and number at some point. You can see what cards are there in the display. If mistakes were made, it’s because you made the mistake. The impact of giving a redundant or useless clue is less serious, but it’s still costly. You have eight clues you can give and if you need to buy more it has to be done in exchange for discarding cards from your hand. You’ll often have a suspicion of what your cards are, but you can never be sure. As such, Hanabi is a co-operative game where it’s entirely possible for failure to descend into recrimination because the fracture points can be clearly linked to individual plays. You win together or you lose together, but there will probably be a player that’s more to blame for the latter than everyone else. Hanabi too, by virtue of its game design, doesn’t even make losing funny or entertaining. It’s just ‘well, that happened’. True, Hanabi isn’t so much ‘lost’ as it is ‘scored poorly’ but the effect is the same. The nature of the game too means that some players won’t get to do anything interesting on some turns – perhaps all of them. Clues go to the players with the most value to offer the display. If you have ones and twos and all the displays are at three or four you can expect your turn to revolve around you telling other people how to make progress. The extent to which you might be given clues regarding your hand is a function of how useful you are. As such, not everyone gets the same chance to play. 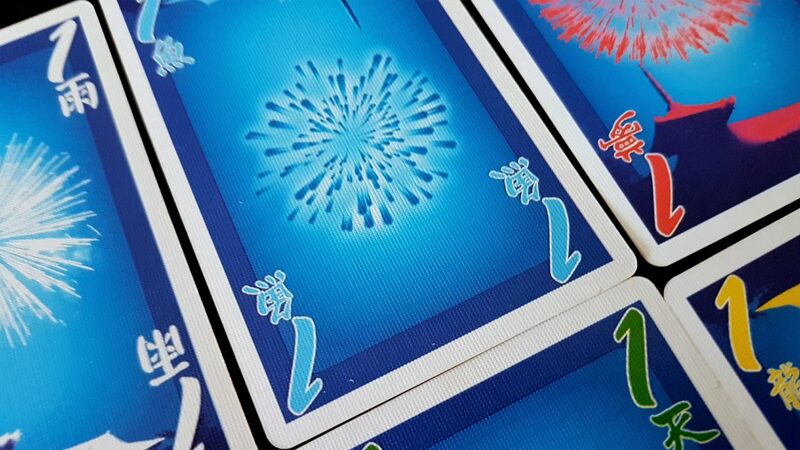 Mistakes in Hanabi are difficult to undo – each card has a duplicate in the deck, but if you need to discard something as a result of play you might end up leaving the game in an unwinnable state. If you play down a three when you needed a two you might leave a firework at that stage for the rest of the game. Waiting for the card to appear again, assuming you haven’t mistakenly discarded both, can be time-consuming and difficult to arrange. Coupled to this, for those where there is an emotional requirement for completion, having a half finished firework can be a source of some angst. All this said though we’ll still offer a recommendation for Hanabi in this category. The issues that we have highlighted with regards to failure and recrimination are intensely group dependent. If everyone is treating it as a bit of fun they won’t be a problem. Everything else can be dealt with as a result of expectation management. The key difficulty associated with play here is holding a hand of cards so that it is seen by other players but not by the player holding them. That’s easily handled through the use of a standard card holder. Cards to which clues refer should be tapped when the clue is given, but nothing is lost by replacing that with a verbal clue. ‘The first and third cards are red’. The same information is conveyed without the need for the physical interaction. Similarly with playing a card – ‘I’m playing my third card’ is enough to unambiguously guide another player to place your card on your behalf. The only other physical actions in the game are collecting and discarding tokens, and those are a communal resource that anyone can manage. As such, we strongly recommend Hanabi in this category. In fact, we might be inclined to recommend card-holders to everyone when playing just for the amount of convenience and comfort it offers. 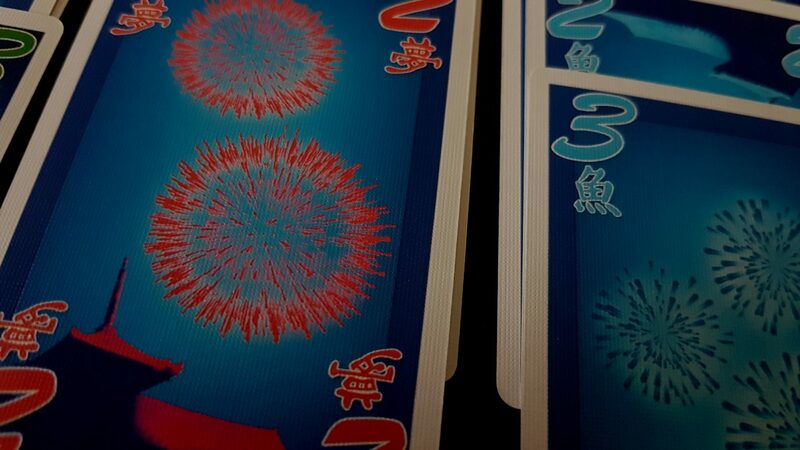 Hanabi is a game of continual but not complex communication. As long as players can indicate colour and numbers, language and communication barriers should not be a serious issue. Players take it in turns to give and receive clues so it’s not necessary for players to attempt to make a point over a wider discussion, or make out multiple conversations being carried out in parallel. We work on the assumption in these teardowns that communication between a group is a mostly solved problem, with some arrangement being made that permits everyone to convey and receive information in some form. You can meaningfully play Hanabi whether making use of sign language, written communication, electronic signals or hand gestures. As such, we recommend Hanabi in this category. The need for communication has an impact, but we don’t think anyone is going to be disadvantaged in play due to the nature of that communication. We have almost completely positive news in this category. Being a game with such a unique theme, it focuses on abstraction in art. The artwork shows splashes of colour rather than people. Unfortunately the instructions default to masculinity in the text, but this comes across as an occasional lapse rather than careless exclusion. Most of the text is written in a gender neutral way, referring to ‘the firework makers’ or ‘the player’. This isn’t uniformly honoured though. Hanabi tops out at five players, which is quite generous, and it couples that to a bargain basement price. The RRP is around £10, which is on the verge of being an impulse buy. True, our review probably gives you a fair idea for how much replayability we think you’ll get out of it but given its almost universal appreciation you can fairly discount our view and take the risk. It even scales down to two players, and while it doesn’t thrive there it is entirely playable. We strongly recommend Hanabi in this category, with a tiny little black mark on account of the occasional careless use of ‘he’ in the instructions. There aren’t many intersectional issues here that wouldn’t already be covered by the discussion associated with individual sections. However, there are a few we should consider. The first is that visual inspection of cards is possible, but it’s going to need a degree of swapping hands and obscuring information. It’s also likely to involve some travel around or leaning across the table. As such, our view on the accessibility of the game hardens somewhat if considering the intersection of physical and visual impairment. For those with fluid intelligence impairments coupled with physical impairments, we’d expect having to add a cognitive cost to verbalising clues would have an impact. Translating ‘first’ and ‘second’ into card position in a hand isn’t a large cost but it’s numerate one that is greater than the physicality of tapping or pointing. This isn’t enough for us to change our recommendation in either category, but it’s not a free adaptation either. 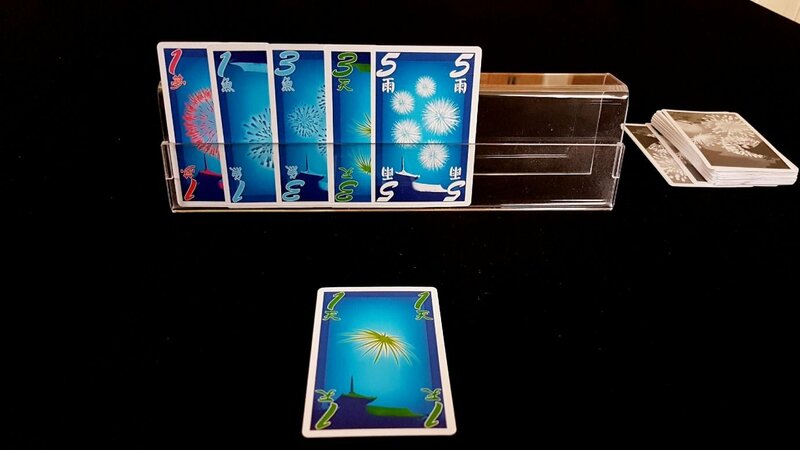 Hanabi doesn’t permit players to drop in and out, because key to the game is that cards are played by someone that has no direct knowledge of what they are. Cards once dealt out are an important resource for play, and it’s not possible to redistribute them or return them to the deck. Too much game information is lost as a result. Often in such circumstances it’s possible for another player to ‘sub in’ for someone else. Even that’s not possible in Hanabi since a departing player is taking with them a mental model of what cards are in their hand. An external player would have to be simultaneously completely unaware of the other player’s hand and yet fully cognizant of the clues someone had been given. A departing player could give a little briefing on what they think their cards are but that may convey misleading understanding and undermine game integrity. However, it plays in under half an hour under most circumstances and as such it’s short enough that players need not worry unduly about exacerbating discomfort, or even ruining an evening of play for everyone else. As such, while Hanabi demands players be shackled to the table it doesn’t make the personal cost of abandoning a game too much to realistically bear. Well, Hanabi took a kicking in a number of these categories but did surprisingly well in others. It just goes to show that even a game which puts an emphasis on communication and social deduction might manage it in such a way as to be inclusive. Patterns and mechanics of interaction can be just as important as the fact of it. There’s still a lot that could be improved in the game – colour blindness in particular is an issue easily solved by making use of either written descriptions of the fireworks or easily identified icons. Kanji is difficult to articulate, but symbols such as ‘flower’ or ‘dragon’ would solve the problem neatly. At some point we’ll be putting together some tabletop accessibility guidelines for designers but Hanabi shows eloquently that you can technically meet the requirement for accessibility without actually achieving it. Each firework is uniquely identified, but I still wouldn’t recommend the game to anyone that was colour-blind. Hanabi is a beloved game. That mystifies us but historically we have not had much positive to say about games that stress light social deduction. Perhaps we will never have a good word to spare about such games. Regardless of how we personally feel about the game we believe there is a burden of expectation that a Spiel des Jahres winner should bear. We feel that they should be exemplars for accessibility as much as they are ambassadors for designer board-games in the wider community. Hanabi is a mixed bag there, and shows how far we have left to go in that regard.